Home / Sale / Books & Media / Can We Feed Ourselves? 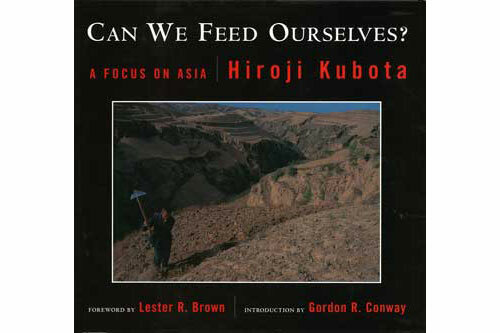 In this compelling and informative book, Hiroji Kubota addresses the growing crisis throughout Asia- the lack of food. In memorable images he portrays varied aspects of the problem from people growing food in improbable and nearly impossible places to beggars and others in want of food. At the same time he documents traditional farming, harvesting, and markets that are often taken for granted. In the words of Lester Brown, “Not every face of every person in every photo of Hiroji Kubota’s collection has an expression of poverty or suffering. The lives of people who struggle daily with insurmountable obstacles are captured in photos. They reflect not only scenes of poverty and despair, also radiant moments of joy and hope.” This small book illuminates a very big problem, not just for Asia, but for much of the world. Photographer: Hiroji Kubota (Magnum, 2001, Pbk, color photos throughout) More information on exhibition.